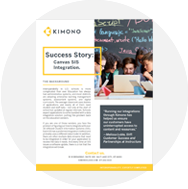 A couple years ago, Canvas and Kimono partnered up to deliver a better data integration solution to Canvas's customer. The integration connects Canvas to the institution’s student information system (SIS) to enable roster synchronization, no matter what SIS the institution is using. It also supports mappings and data transformations that helped Canvas meet each institution's individual requirements. The real test of any edtech solution occurs during back-to-school, and this year the Canvas team was thrilled to see their SIS integration support burden cut in half. Read more about this remarkable result. If you are a Canvas customer, visit our Instructure partner page to find out how you can utilize the Kimono Canvas Integration.